Shukan AKB 28th May Summary | IXA Ready - Fist On! It was a continuation from last week in which certain members are given a challenge to complete. They’re allowed 90 mins to practice before they have to do the challenge in front of their peers and Speedwagon in the studio. First up today is Jurina. She had to do exactly as what Kojima did for a recent AKBingo challenge and that is to pull a cloth from a table without tipping over glasses. Jurina starts very confident and has no problem in managing to pull a cloth with 1 or 3 glasses or even with some plates. She does fail however when the cloth is changed and there’s a full compliment of 8 glasses on the table. Can she pull it off in the studio? I thought this challenge was even more difficult than Kojima’s because not only are there 8 wine glasses, 2 plates with food and some cutlery on the table but the wine glasses are half full of wine. Now that is tough but you know what. It’s no sweat to her as she manages to do it quite easily. Jurina is bloody awesome. The 2nd challenge is for Sasshi. Her challenge is to pull a white rubber glove over her head and blow it up using her nose until it explodes in 1 minute or less. In her early practices the glove keeps breaking because of her nails so she cuts them. It doesn’t look good as she doesn’t manage to keep hold of the glove long enough when she’s blowing it up. It keeps flying off her head. Let’s hope she gets it right in the studio! It’s time for her to go and it starts out looking good as the glove keeps expanding and expanding. The clock is ticking down and finally the glove explodes. Sasshi succeeded with barely 2 seconds to spare. She cried tears of joy afterwards. Good on ya Sasshi!! Challenge no 3 is for Kitarie and she has to learn how to play the flute. Her tutor is Nito Moeno who’s pretty nifty at playing the flute. Kitarie is a complete novice on the instrument and it shows. She’s finding it very difficult to get a sound out of the instrument even with Moeno showing her how it’s done. The frustration is getting to her as you can see tears forming in her eyes but finally she manages to get a sound or two. Is it good enough to clear the challenge in the studio? 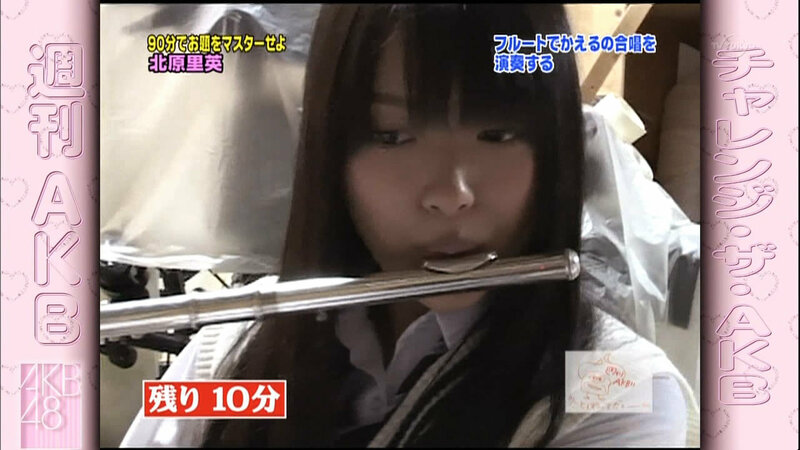 Well she does manage to do half a scale on the flute but it’s not very convincing and Kitarie fails on her challenge. Never mind Kitarie. The final challenge on this week’s show goes to Takamina. She has to balance on a large beach ball and move it with her feet for 3 metres whilst also twirling a baton in her hand. Her tutor is a circus clown. She doesn’t do that well in practice but I had every confidence in Takamina completing this one. In the studio she’s away and the look on her face is intense as she’s concentrating so hard but Takamina manages to complete the challenge. Attagirl Takamina, that was immense!! Shukan AKB News – more on the senbatsu election and the date of the final result which is on 9th June and a small preview of the Majijo Teppen Blues PV and it’s over for this week’s show. Next week: more challenges for more members.